From Kotobukiya. From the film Fantastic Beasts: The Crimes of Grindelwald, comes the Grindelwald 1:10 Scale ARTFX+ Statue! 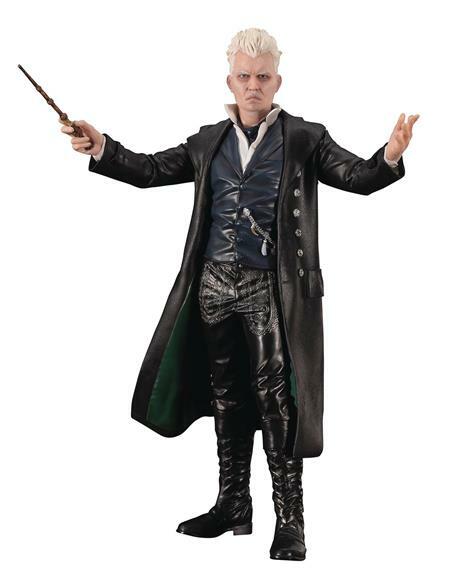 This 1:10 scale statue recreates Grindelwald's appearance from the film as portrayed by Johnny Depp. The wizard holds his wand at the ready with a look of determination on his face and stands roughly 7-inches tall. The statue's feet are embedded with magnets, allowing you to display Grindelwald atop the included metal base alongside the Fantastic Beasts: The Crimes of Grindelwald Newt Scamander 1:10 Scale ARTFX+ Statue (sold separately)!